We have over 1,000 sqft of showroom displaying a large range of Major Appliances. 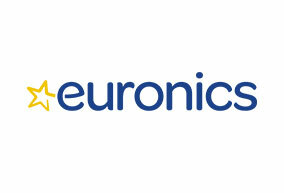 If a particular product is not in stock we have three times weekly deliveries from our buying group, Euronics, and direct accounts with manufacturers in order to obtain pretty well any product very quickly. Our showroom staff have been with us for many years and have expert knowledge in most of our products. We offer a friendly, no pressure service in a relaxed atmosphere. 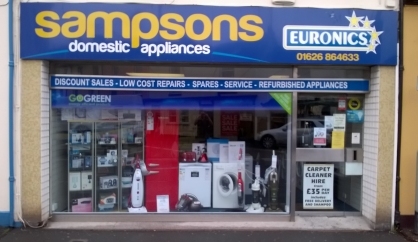 Sampsons is a local family firm having been established in Dawlish for over 40 years. 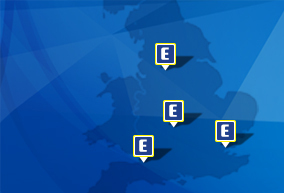 Sales, Repairs and Spares of most makes of Domestic Appliances and our friendly helpful approach are the reasons for our local success. 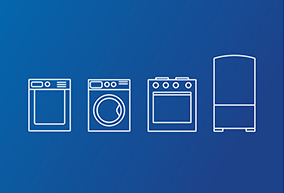 Washing Machines, Tumble Dryers, Fridges, Freezers, Cookers, Built-in Appliances, Microwaves, Dishwashers, and Vacuum Cleaners. Irons, Kettles, Toasters, Heaters, Hair Dryers, Batteries, Bulbs, Electrical Accessories. Portable Digital TV, Large LED TV, Plasma TV, Set Top Boxes, DVD Players, Personal Video Recorders, DAB Radios, Indoor Aerials, Leads and Accessories. Sampsons Domestic Appliances	will use this area to update our customers on what’s happening in the store as well as fantastic manufacturer offers.